There and Back Again: Final Days, So Much to Do!!! Final Days, So Much to Do!!! Oh yeah, we went there, it was crazy interesting!!! We couldn't leave Korea without checking out the DMZ and JSA! 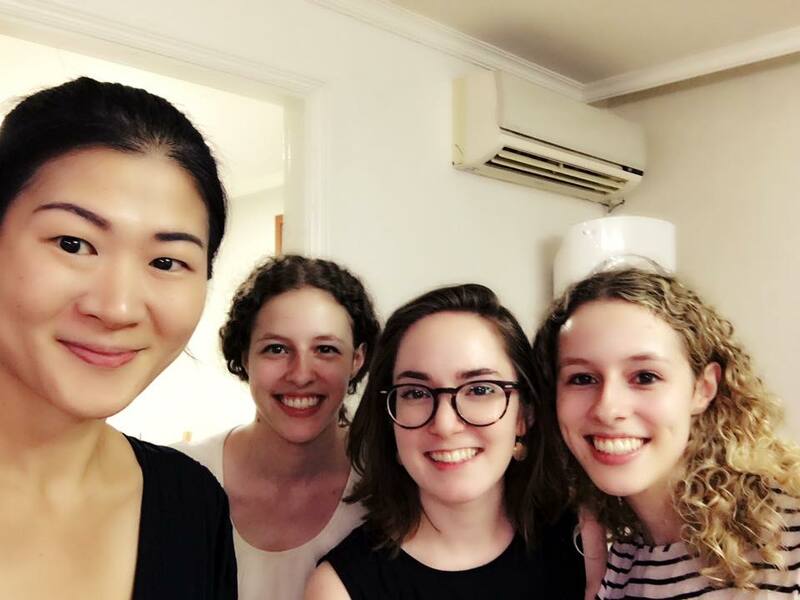 Pre DMZ, we had a holiday on Monday, so I started cleaning my house and prepping for packing, then Ces and I met up and ran some errands in Hongdae. The errands mostly included going to the Studio Ghilbli stores around the area. They just opened a new big one! Most of the stuff is actually from Japan and therefore way overpriced, so we just looked. We accomplished our mission though. After visiting various sock stores, cause those are a thing here, I finally managed to find a full set of Howl's Moving Castle socks! We tried to go to bed early because on Tuesday we were off early on our grand adventure toooooooo NORTH KOREA (kind of). We had booked a trip to the DMZ and JSA a few weeks ago, and it was finally time to go. We couldn't have lived here this long without going, right? I mean, it's like 2 hours away. The tour, especially to the JSA, was very strict and photos were allowed only for very limited time frames and at very specific points. North Korean soldiers would be watching us the whole time, they said, so don't wave or instigate or do anything stupid. It was pretty tense but really interesting to see. We even saw a North Korean side tour over in the grey building. After a semi tense morning (you're driving by fields full of landmines and marching carefully in two lines and being herded quickly places, it's rather nerve wracking), we stopped for delicious bulgolgi for lunch. The DMZ is a lot less tense, because the DMZ is the entire de militarized boarder, rather than the UN controlled Joint Security Area. Actually the DMZ tour was less interesting, but also less intense. I also think people confuse the two and assume that by going to the DMZ, they will see the JSA, but this is not the case. In the DMZ, we visited 3 places. The first was the 3rd infiltration tunnel. After the armistice, remember, the two Koreas are still technically at war, there was some peace, but a North Korean defector admitted that the North was building tunnels towards the South, with the intention of attacking Seoul. He was surprised they hadn't found out yet, so the South started searching. It took them a while to find the tunnels, but so far they've found 4. The North denies this was their intent, but the dynamite marks and directions certainly indicate it wasn't for coal mining, as they claimed. They even painted the tunnels to pretend they were mining for coal, even though there isn't any in the area. It's tiny and very cold down there, which was a welcome change from the 90 degree heat. You also can't take pics down there, but we got to walk up to the blockades the south put in. The tunnel was very narrow, maybe 2 meters wide, but apparently can move an entire unit in an hour. Kinda scary thought that this was happening. Now it's a touristy site. The whole place is a little sad, cause the JSA and DMZ have lots of messages of hope for reunification, but things seem to be going in the other direction recently. I wonder if the 2 will ever become one country, or at least be on better terms. We also visited an observatory where you can look into North Korea and see the propaganda village. We even heard a propaganda song about how great it is there and how people should come to that side. Dorosan station is one of the northernmost stations in Korea and used to connect the two, and there is hope that, with reunification, a railway connection all the way from South Korea to Europe could be achieved. This train station was used to take materials to the Kaesong region, but shut down in 2008 by North Korea when a more conservative South Korean government was elected. Now you can take the DMZ train from Seoul station to here, but it isn't used for much else. It was surreal to see, and the day was tense and interesting and sad and a whole lot of feelings all in one, so Ces and I were exhausted after. I loved being able to go on the tour though, even though I was totally worried something could go wrong while we were there. We've been practicing a lot for our last Dance Joa show of our time in Korea, so that's been draining but fun! To relieve some stress, Ces and I went to a different cat cafe to hang out. This one had so many munchkin cats with stumpy legs!! 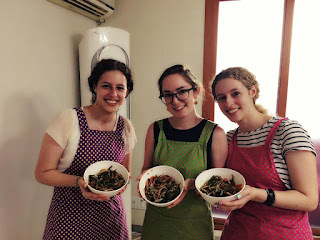 On Wednesday, we took a cooking class! We made Kimchi jiggae, japchae and jaeyook bokeum, which means kimchi soup, glass noodles with veggies and stir fried pork. It was super fun! make another! Jomin, the teacher, did all the cleanup! On Thursday, before dance rehearsal (agaaaain), we headed out to try Shake Shack, and the line was a little long, but not too bad. 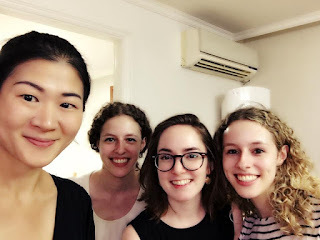 On Saturday, we met up with Grace and her BF to head to his friends pension (which in Korea means like, cabin or lakehouse) to hang out for the day. This is apparently a Korean thing to do, and I'm glad we fit it in. The boys wanted to go fishing, so we hung out in the creek and also just sat around listening to music and chatting and relaxing. 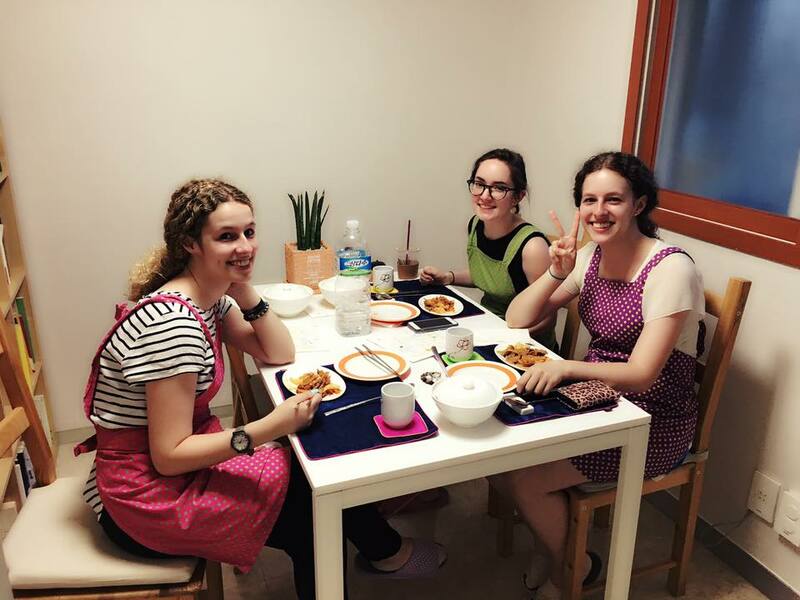 We went shopping for food and had a delicious BBQ, then learned some new Korean games and such. It was so relaxing and fun! It was also scary cause I saw my first ever Asian hornet so excuse me while I go cry in the corner while shaking in fear. We returned sunday to a full day of practice at the studio, which was our first with the whole group in ages. OUr group is bigger this time so there are some frustrations, but I'm just gonna do my best!! I'm coming home in a week. CRAZY. Cats, Tours and a Whole Lot More!